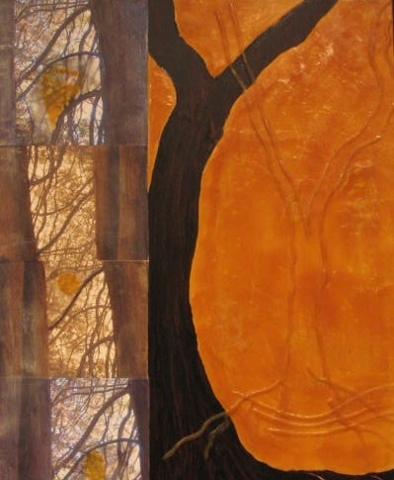 My Encaustic paintings are simply expressions of how I feel the world. The world and relationships outside my body move me. The paintings as disorganized energy live inside me. There is the visual language that comes from what I see and interact with and then my internal language becomes what you see in these wax paintings. I walk in the woods and the magnificent colors and lines and history of trees standing follow the light and reach their trunks and branches up and towards the sun, those random lines that become the forest. I see these, I capture them , bring them home then see them again in another context. Perhaps my own modern dance, the same energy that makes me a twitchy person finds it’s way out into something quite heavy and grounded and secure. Parts of trees and sticks and leaves and grass that I didn’t plant are lying on the ground on Marrowstone Island and I see what looks like the quiet after a storm. Joy jumps up at the opportunity to photograph the evidence laid down after the winter. My daughters grow up and I can’t stop them and we go around and round until someone lets go.........there’s the story of that then there is what happens inside me then back out onto plywood with hot wax and tar and graphite. My process is very private and internal. First a line, a shape, then the next and the next, I work fast, I work on many pieces at once. I come back to them after a month, I dig into them when they are horrible and find something in another layer that eluded me in the first place. I grab a new pile of cut boards, random sizes, different woods and I go!